The annual UNIV Congress brings together thousands of students from around the world for Holy Week in Rome. UNIV offers participants a variety of academic, cultural, and spiritual activities as well as the chance to see the sites in Rome. 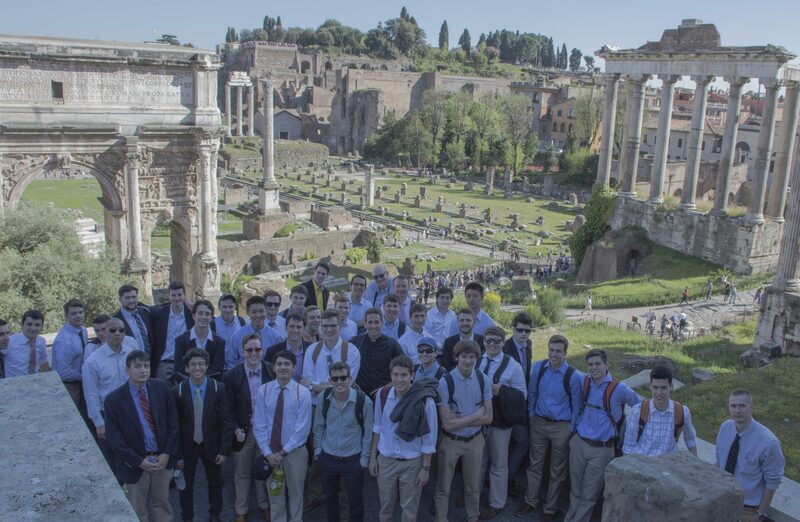 Through lectures, discussions, and visits to historical sites, students are exposed to the lives and ideas of the great men and women who have lived in Rome, past and present. A highlight of the week is the academic conference that gathers students from over 40 countries to discuss fundamental issues facing humanity today. It offers a unique academic and cultural experience for those who wish to reflect on significant world issues in an international setting. The main sessions of the conference take place on Tuesday, April 16, from 10:30 am – 6:30 pm, at the Pontifical University of the Holy Cross (located one block north of Piazza Navona). The theme for this year’s conference is “Getting Down to Business: The Transformative Power of Work.” For more information, visit www.univforum.org. Application deadline: The deadline for applying to the trip is February 11, 2019. Written submissions deadline: The deadline for submitting papers is March 15, 2019. Cost: $1,075 (covers lodging, meals, and transportation while in Rome). The cost does not cover airfare or pocket spending money. Deposit: A $200 deposit is due at the time of application. Payment deadline: The full balance for the trip is due by March 28, 2019. Making payments: To make a payment, click here. Questions: For more information about the UNIV trip, contact Justin Reckart at 773-283-1099 or jreckart@sauganashcenter.org. For more information about the UNIV Congress: See www.univforum.org. Students can participate in the conference in a few ways. First, they can attend any lecture or presentation or join the discussion in any of the many seminars. Secondly, students can participate more formally in the conference by submitting a paper, a video, or a work of art or participating in one of a number of competitions. Picking your paper topic: Papers should focus on the theme of this year’s conference. The UNIV Forum website provides resources to help you choose a topic, including: a description of this year’s theme, a list of possible paper topics, and a helpful bibliography. You should talk to your adviser to help finalize your paper topic. Adviser: A student must have a professor or teacher as an adviser. Submitting your paper: Papers must be submitted online here no later than March 15, 2019. Please also send a copy of your paper to univ@ysi.org to be considered for the scholarship. Oral presentation of papers: Participants whose papers are accepted will give 15 minute oral presentations at the conference. These presentations should be prepared before leaving for Rome. Scholarships: YSI awards partial scholarships to students whose papers are accepted by the conference. Paper acceptance: Students will be notified of paper acceptance and scholarship shortly before the conference. Details: For more information about writing a paper, including a list of tips on giving a good presentation, please visit the UNIV Forum website here. Videos: Students can produce a 5-10 minute video reflecting the theme of the UNIV conference this year. Theme: To learn more about this year’s UNIV theme, go to www.univforum.org. Scholarships: Partial scholarships are awarded to teams whose video is accepted by the conference. Details: For more information about UNIVtube (guidelines for videos, registering for the competition, submission deadline, etc), please visit the UNIV Forum website here. Debates: Participate in a team debate competition. More details available here. Social Initiatives: Submit a short video about a social initiative to compete for a grant. More details available here. Arts: Submit a work of art to the artwork competition. More details available here. Case Competition: Compete in a business case competition. More details available here. 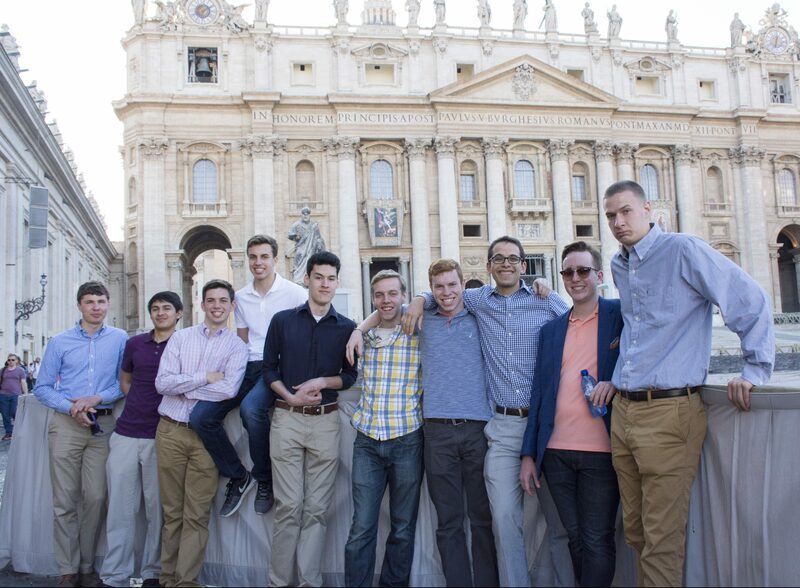 The U.S. group will leave for Rome on Friday, April 12 and return on Monday, April 22. A number of days will be spent seeing the historical and cultural sites of Rome. The group will also participate in many of the Holy Week services and activities taking place in Rome during those days. Traditionally, the group attends an audience with Pope Francis and a get-together with the Prelate of Opus Dei, Msgr. Fernando Ocáriz. UNIV is sponsored by the Institute for University Cooperation (Instituto per la Cooperazione Universitaria – ICU). Founded in 1966 to foster cultural, scientific, and educational exchanges world-wide, ICU annually brings together university students, educators, and leading professionals to discuss important issues of the day. The U.S. trip to UNIV is organized and sponsored Youth Service International (ysi.org) and directed by staff from Sauganash and other centers similar to it around the country. YSI organizes and directs activities for college and high school students from around the country.